Is The Hybrid OR For Trauma Useful? Gee, the hybrid OR sounds like a great idea for specific trauma patients. But we’ve seen this before; great idea but doesn’t always translate into a positive result. Is there any literature? Unfortunately, very little. A group from the University of Calgary in Alberta published a very detailed paper on the nuts and bolts of how they designed their hybrid room from scratch. This paper is very detailed, and the hospital personnel were very thoughtful as they approached the time-consuming and expensive task of designing and building their hybrid room. Of course, they chose a silly acronym as so many do. They called it their RAPTOR room (Resuscitation with Angiography, Percutaneous Treatments, and Operative Resuscitations). Sigh! Next, they retrospectively analyzed their experience with persistently hypotensive patients arriving at their Level I trauma center over a 17-year period before their hybrid room opened. Sounds good so far! But we need some more data. Unfortunately, there’s not a lot of it yet. A Japanese group described their experience with treating patients in OR then IR, vs a “hybrid procedure.” This did not involve the use of a true hybrid OR. They moved a C-arm fluoroscopy unit into an OR and part of the procedure was carried out by an interventional radiologist. Bottom line: This is quite a unique room. Unfortunately, it is not ideal because it is small and cramped. It looks like it would be difficult to fit more than one surgical team in the room. However, the results look good. We are finally starting to see objective data involving a reasonable number of patients. A minority of trauma programs have a hybrid OR available to them, and the number of patients who would benefit from it is low. But if a patient needs it, this setup can be life-saving. So who are those patients, exactly? Tomorrow, which patients may benefit from a hybrid OR? 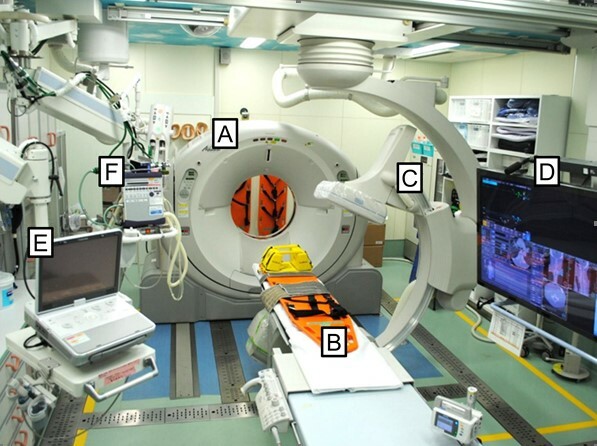 The evolution of a purpose designed hybrid trauma operating room from the trauma service perspective: The RAPTOR (resuscitation with angiography percutaneous treatments and operative resuscitations). Injury 45:1413-1421, 2014. The potential benefit of a hybrid operating environment among severely injured patients with persistent hemorrhage: How often could we get it right? J Trauma 80(3):457-460, 2016. Hybrid treatment combining emergency surgery and intraoperative interventional radiology for severe trauma. Injury 47:59-63, 2016. The Survival Benefit of a Novel Trauma Workflow that Includes Immediate Whole-body Computed Tomography, Surgery, and Interventional Radiology, All in One Trauma Resuscitation Room. Ann Surg 269(2):370-376, 2019. Previous PostWhy Use A Hybrid OR For Trauma?Next PostWhich Patients May Benefit From A Hybrid OR?